In 1891 John Polinelli migrated from the colony of Lombardy in Italy and began his life in Australia as a young farm labourer in the County of Towaninnie (Lalbert). In July 1898 he applied to the Department of Lands and Survey, through a special Land Board at Wycheproof to select a section of land. This land was a block called Allotment nine in the Parish of Chinangin, County of Tatchera which was situated eight miles south west of Ultima. The following is an extract from application. "I am single. Have never selected before. Own no land. Have one hundred and fifty pounds at interest. I have no farming implements. 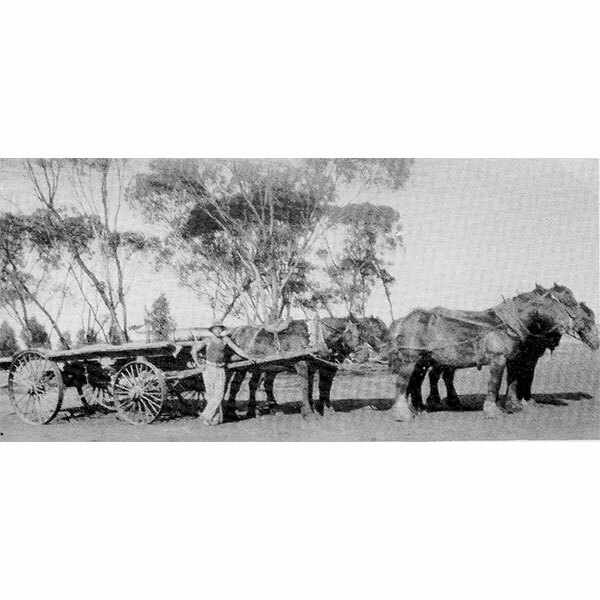 Have been doing farm work for about six or seven years - nearly all the time in the Mallee." Following acceptance of this application, John took an agricultural perpetual lease in 1899. He continued to lease this land until a crown grant of land was finally issued in 1942. John became an naturalized citizen in 1914 and married Mary Bombardieri in Swan Hill. John and Mary set their family home on the farm and raised four children; Ivy, John (Jack), May and Michael (Mike). All four children attended the Forest Tank School which opened in 1913. The school was erected on a 21/2 acre site which had been offered to the Department by John. The Polinelli Family also offered accommodation to the school teachers. A room was included in the new home which replaced the original family home following a tragic fire. Ivy and Mike contributed to the social life of the school by playing the piano and violin at the school dances. Mary Polinelli died in 1929, leaving John and the young family to battle on. Ivy and May continued with the household chores until Ivy married Edward Power of Meatian West. May cared for her father and brothers until her marriage some years later to Harry Rogers of Berriwillock. Jack and Mike assisted their father with the work on the properties. Further land adjacent to the first block was purchased in 1947 from W Tuck. Later, Block 3 was purchased from J.D.K. Bain. Mike married Lavena Clohesy of Sea Lake in 1943 and they lived in the family farmhouse. In 1951, following the closure of Forest Tank School, Mike, and their children, Gavin and Moira, moved into the township. John had retired from farming and spent his final years with the family until his death in 1953. Jack and Mike continued to until Mike's death in 1957. Mike's son Gavin assisted his Uncle Jack as best he could as he was still attending Swan Hill High School. Finally he left in 1960 to work on the land. Following Jack's death in 1961 took over the farm at the age of sixteen, with the help of his mother. Gavin married Doreen Griffiths ofin 1966 and they have 5 children; Craig, Karen, Paula and twins Bradley and Karla. Gavin purchased land from O'Tools in 1973 and had a house built on the property. Craig joined his father on the farm in 1984. They purchased a property from Atkins, known as Conway's in 1986. Moira, a school teacher, later married Joseph Higgins in 1969. They home in Swan Hill for a time and now reside in Mt. Eliza with their two sons, Paul and Mark.